BearcatTailgater.com: Cats Chat with NeumannKy!!! ...not quite yet, but I can't remember a time in November when I've been more excited about the state of Bearcat Football! The Bearcat Tailgate Crew made the trip to Morgantown to watch what could one day be called the passing of the 2008 Big East torch from the always dominant WVU Mountaineers to the "we think we've arrived and are now trying to prove it to the world" Cincinnati Bearcats! The Bearcats have faced a remarkable amount of adversity this season and to be sitting in the conference driver's seat with 3 games left to play is nothing short of miraculous. The season's not over yet and I have a feeling BK and his crew know this fact as well as anyone. It's a great day to be a Bearcats Fan, now on with the famous NeumannKy's weekly recap! The BTC arrived in Morgantown around 3:00 p.m. with the Ultimate Tailgate Trailer in tow. Fellow Bearcats fans were scarce. Seeing Bearcats fans in Morgantown is like seeing a Bengals win this season. It doesn't happen often and you don't know when the next one is going to happen. Luckily most of us found each other over the course of the afternoon and "the Crew" once again hosted a most successful tailgate. Morgantown is a pretty unfriendly (not to mention ugly) place to visit, however I was pleasantly surprised by the behavior of the fans this year as opposed to 2003 (the last time NeumannKy made the trip). Any beer I was wearing, I spilled on myself and I never once had to duck out of the way of a bottle thrown by unruly Mountaineer fans. Where do I start? The defense had their best game of the season and was nothing short of spectacular while the offense sputtered and missed a handful of opportunities to really put the game away early. Nevertheless, the Bearcats came away with a "W". After watching a 13 point lead deteriorate in the last 1:11 of the game, the CATS did what great teams do, the defense responded by sacking Pat White on 3rd and 3 in OT while the offense responded by moving the ball 25 yards for a winning touchdown which is the furthest they moved the ball the entire second half. 1) Defense, Defense, Defense - they say defense wins championships and this looked like a championship level defense. No one player stood out. They all played their best game when needed. 2) John "White Lightening" Goebel - Jacob Ramsey had the bulk of the rushing yards, but after rewatching the game, Ramsey could have had an extra 35 plus yards if it wasn't for all the holding calls plus he had a huge 66 yard reception late in the 1st half that set up a field goal attempt. 3) Mardy "With the D" Gilyard - 104 yd kickoff return...he's good. 1) Holding, 1o yd penalty...Holding 10 yd penalty....upon rewatching the game, the offensive line took about 35 rushing yards away from White Lightening and could have been blamed for the lose, had the Bearcats not pulled this one out. 3) The ESPNU Announcers - They didn't even know what planet they were on. The CATS go on the road this Friday AND MUST RETURN THE KEG O' NAILS. Seriously, I'm tired of losing to Louisville. I think the CATS will be ready and BK will have them focused and not looking forward to the Pitt game. Brian Brohm is gone. This is a struggling Louisville team and after the win over WVU, every game from here on out is the most important in program history. I think the CATS win this on 35-17. The BTC will be in Louisville no later than 2 PM this Friday and will be bringing the Ultimate Tailgate Trailer. We are putting together details now. 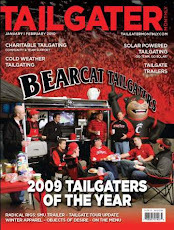 Tune back in to Bearcattailgater.com this week for details on the tailgate! Until next week, keep rooting on the CATS and always tailgate hard! !